Dist. by Wm. R. Forder Souvenirs, North Bay, Ont. Item is a postally unused postcard showing the upper falls. 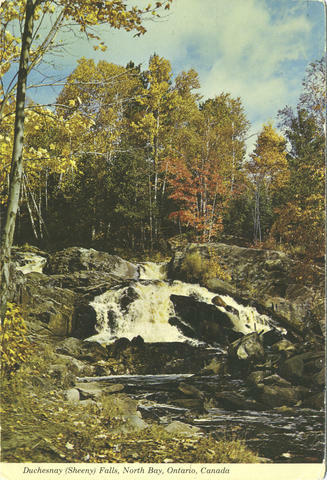 Description on the rear reads: Duchesnay (Sheeny) Falls can be fiwed form Hwy. 17 as you enter North Bay from the west. Pictured is the upper falls which is just a few hundered feet above the main falls that is visible from the highway.